Thanks to Martin Edmond who shared this on fb and wrote - "Matisse : Porte-Fenetre a Collioure (1914). Painted just before the outbreak of the Great War but not exhibited until 1965. 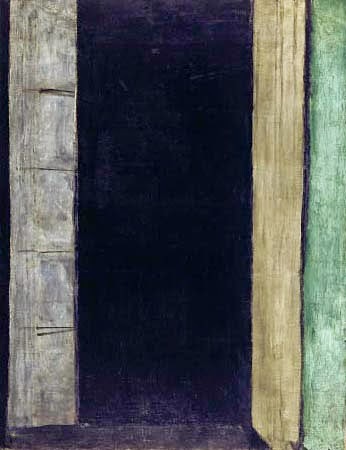 Louis Aragon called it Matisse's most mysterious painting . . . 'the black future, the inhabited silence of the future.' "
The future is always, to an extent, an unknown place. When the future arrives, it turns into the present, like an inter-dimensional space ship landed and then opened infinitely out to become the world. We see, hear, taste, smell, touch, dream, imagine and allow our memories to affect us, here in the now, but not in the future. We could imagine, for instance, what our children may appear like grown up. We see them in various imaginary ways, older. But they may surprise us to an extent, or our responses do, or both, when any future time truly does arrive. What-happens-next presents this great unknown place of endless possibilities, but the present just occurs as we live it. At times it is frustrating not to know the future nevertheless, and I hope that Matisse painting above, chosen to illustrate this beginning - a work painted before an immense war - is not indicating trouble ahead. But who knows? In just over a month I return to amrka, where I took myself alone about two years ago to meet, for the first time, talented, sympatico writers who I'd only ever known online, before. We were all delighted with this eventuality. It felt at the time like a miracle. We live in a startling age where such wondrous acts are possible. I travelled by ship, (less carbon expended then), to Hawaii, where co-incidentally a New Zealand writer I already knew was working and they showed me around, then to San Francisco where a non-fiction writer of more recent acquaintance, (we played Scrabble online together and chatted about many things), lived. Luckily this gradual introduction to my poetic journey was possible. I'm not sure I could've taken in the mind-boggling remainder without Anne Kennedy's, and later, Adam Gillitt's kindness to me, in those initial, previously unknown places which were so beautiful. Friendship arguably matters more than anything else in human activity, beyond the basics of gathering or making food, clothing, and shelter. A mysterious state in some ways, but amicable we seem to forgive friends many foibles and can never completely explain why we care so much about some unrelated person we know, or the other. Although of course we are possibly at our best when friendly within our families, too, surely? The obvious ease and joy we present to each other through friendship evokes life's everyday, and self-made, music and poetry - we may say - great images of dreams and plans, then we somehow develop together better ways to dance and move through our existence in natural and helpful configurations. Buddies, cohorts, friends and mates create many kinds of metaphysical art in cahoots and these assist us immeasurably. People on our side help us to be ourselves too, though, and to discover much we would otherwise never know - perhaps often of great use - and they make us feel good. "Someone like me," we mutter delightedly. "They get what I mean, they like what I like. O wow, they have something new that I like too." We share so much with friends, often feeling uplifted to have found a stranger and grown to know them, then found much in common, meanwhile discovering new information, places, food, and much more due to our relationship, our listening, our interaction. O and yes, those close to us may also encourage our gang of two into behaving badly, neither quite realising the danger until it appears terrifyingly in front of us as a dire consequence we may not avoid. This provides a test of friendship, any extreme is a trial, because however we behave then shows how strong our bond truly is, and what we are both capable of in an emergency, or difficulty. In such circumstances we learn more about each other, as well. One friend or the other needs to be ethical, clever and careful in order to stop the disaster developing, call stop, point out the nonsense or danger. Or at times both may do the safety dance together. But sometimes a few or two friends part company because the other wild friend or cohorts did not stop on their haphazard course, when their reluctant companion, or more than one, grew some sense and sensibility, instead of carousing, smashing, plunging blindly into an experiment and so on, ad nauseam. Uh o. Watch this summer/ bloom kinds of revolution/ people drawn to spin/ better yarns - embroidered, (usually distressed or odd) retro linen, poetry by Raewyn Alexander - I allow the material to 'speak' to me, then straight away embroider what I think it 'says'. This is part of a large calico book of these, which I hope to exhibit with many more books I've made, large and small, in 2015 or so. The whole of our human life presents a learning experience, we may do this consciously or unconsciously, or both together. I've chosen to go back to amrka once more, to visit new sites, see the same ones differently, and above all else to see those diverse, yet strangely also somewhat alike, writer friends I at last met - only once before - years ago. One of them convinced me with only two words, in the end, but I already wanted to return in any case. Prompting surely qualifies as an excellent talent, anyway, I'm thinking now. I missed my amrkn friends and their lovely country so much it made me ill for a while back in Aotearoa NZ. To have been that welcome there, so engaged with those I met and interacted with, and o so happy, infused with genuine love and kindness, life-changing. My trip also gave me the first real holiday I'd had for about twenty years, travelling for once to where I wanted to go. Now, this new trip won't be the same adventure, naturally, but a magical sense of the loveliest impossible being possible, remains. This time, two years later, many other shades appear in the image of what's probable, deeper colours merge, rather than sparkle. The first trip full of light, silvery and golden, like Christmas, unreal, benevolent, and so rewarding, like being a child again and believing in fairies. This time it's more like another festival, perhaps Halloween, even though I'm visiting their summer from our winter. Supernatural nevertheless, and exciting, but perhaps also more sombre and somewhat alarming. Writers do, however, reveal a great deal in text, understand this. Our online correspondences are not the everyday notes some others could think 'everyone' sends out there. We're certainly not everyone - is anybody? Our work's also somewhat rev olution ary, so we're passionate and poli tically savvy, well read and educated, while also surely hoping we're able to behave well when delighted, or thinking about what to do next. But yes, so, we've experienced real time, actual encounters in our history now, much talk, many sights, shared experiences in the actual.... Inevitably this deepened and changed who we are to each other. Much appeared not as easily controlled as writing is to create too, 'Life is not a career' Jane Campion, famous director, said recently, I'd add that life is also not all our own individual, conscious creation and we may sometimes find ourselves in situations we couldn't have foreseen. Friendship then has to serve us well. For a long time I said those writers met initially through writethis on msn groups, (now sadly defunct), an early version of social media, I said they saved my life. I still think thus, but now they're also more truly a part of my life too. A strange feeling to believe you were born in the wrong country, to feel like you do not belong there, to always look outwards for something else, something more suitable and enjoyable, more fulfilling, more of a good fit. A large, touristy, framed picture of the Swiss Alps appeared when I was about five. My Aunty Mary told me they were mountains in another country, over the sea. She had visited Europe, and told me tales of it. To discover there was more than just the suburb I lived in, more than the river plain town, (and other New Zealand places) gave me at last such joy and hope. I carried that picture around, hid it for when needed. Sometimes I sat by the front door at home and looked at those mountains; chanting to myself quietly, "There is more than this, there is." To endure a repressive, narrow life, where I felt I did not belong, broadening my horizons - even if a cliche, the truth of it set me free. Years later I did see the Swiss Alps on our travels, a lovely boyfriend and I. We swarmed all over Europe and Britain, called into LA on the way home. (I've been to about 20 or so countries now). To discover the carbon we belch into the air is endangering our existence on this planet, and the lives of many other animals, other flora too, distressed me so much I had to change. 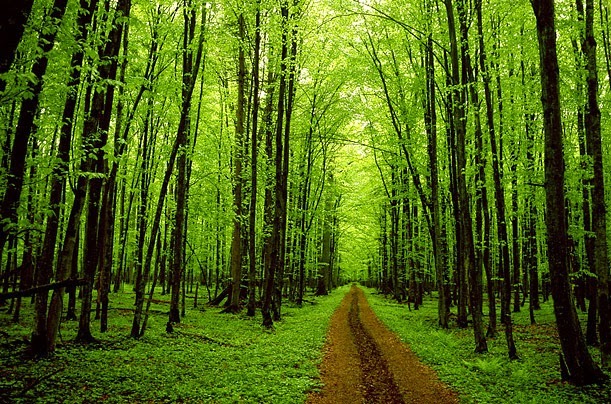 I love travelling, I love Earth, so I buy trees for travel these days to cover the carbon I create through my actions. I also went vegetarian to reduce my carbon footprint. The trees bought are in Australia because they need them, and provide oxygen for everyone while absorbing harmful atmospheric carbon. Human beings have removed half the world's trees since we came into existence. We are symbiotic with trees, they make the air we breathe, they release oxygen. Replacing trees now is our survival. Take part, believe in changing the future for the better, why not? Already I've paid for the trees to cover this trip, just 200 $ NZ, not much to spend. That's enough carbon-soaking trees to cover a return flight to Europe and back, which is about what going to Amrka is like, at a guess. I intend to buy more trees, double for this trip, to do more than my share, because so many people do nothing to clean up their own mess - you can't or won't? Why? It helps me to stay happy to think I'm being responsible, caring for our beautiful world and other people and animals, along with myself and my offspring and their children and.... A deep satisfaction results from this buying trees for travel, and it lasts. The truth now in 2014, two years later, however, is that no trip can ever be the same again, so I'm not seeking anything like a repeat of the stunning surprise of some of our group meeting for the first time, this second visit. Instead, I see where I'm going as rather scary, unknown, any shimmer or sparkle yet to reveal itself. I have no control over these visions, manifestations of what's probable - and in any case I need to make sure I am careful. Frightened and wary, but embarking anyway. I over-react to emotional situations, it's part of a condition I have and am learning to control. I've had it all my life, it's from being treated badly and being highly sensitive, (a rare but normal condition), but I refuse to allow my fears to make me stay home. Those who seek to stifle or mistreat us, they must never succeed. We must stay strong and good to the best of our abilities - yes, mistakes are possible, of course too everyone's life is flawed to some degree, and mishaps interrupt our idealism or bliss or routine or life-style, but mostly I believe people want to behave well and live a fine life. Those people are the decent company whom I need and aim to associate with, being like them. Carefulness must underpin what we do so that life and love are real, I've been taught this. A fair task to set oneself after being reckless already, surely? It appears that foolhardy behaviour results in chaos, certainly proven in younger days, (we learn so much then). Now my new regime is carefulness and believe me, for someone used to 'not caring' or 'throwing myself into things', it's a novelty, and therefore also exciting. Who knew that calm and peace could feel so extreme and vital? Seattle this time for a week, I think, seeing wondrous Amy and making my mother's plum sauce there, o yes we are, (still cannot quite believe I'm going), seeing Dean too when he can free himself from fascinations and machinations. A sombre and rather elegant place, Seattle, with many tall dark trees, and much gloom in their skies, then I fly to Iowa. My fine friend Julie and her wonderful family, husband and two children, plus a grand-daughter and so on, live there - quite a lively group, o my. Lovely, clever, plain-speaking people, and good-looking too - hopefully not immune to flattery. I love them so much I want this bunch to live in New Zealand, or at least visit us, I guess we're working on it. When I said I wanted to be a writer at 14 no one even heard me. The idea so preposterous to small town New Zealand it was as if I was speaking Martian. Now, I am a writer, however, and published in three countries, my latest book available world-wide. The internet revealed my beloved amrkn friends, from a culture open to more ideas and arts than ours. Cyber-technology has also brought my work to the attention of the world - around 13,500 hits on this blog now and always rising. O but I wish I had the time, money and energy to see everyone I visited last time, to travel again to Chicago and lovely Laura, good friend Nigel and Ava, kind Stephen and his wife, to NYC and the irrepressible James, insightful Julie Tersigni. But this visit I go to New Orleans to finish the latest excursion. Louis Armstrong saved my life too, you see, when I was a baby and child. His recorded music and much jazz of that era an adopted uncle played endlessly on his hi-fi. Uncle Bob and Aunty Maisie had arrived from overseas with fresh technology and LP records. My mother co-incidentally made friends with Maisie on the bus when Mum was carrying me. For years this kind couple took me out to town and so on, gave me lots of attention, practising for when they did have their own family, just doting. Now, I need to see where that life-saving music came from, to also give back to a city badly treated by the administration after that terrible flood, and to celebrate the wonder and beauty of truly loving. 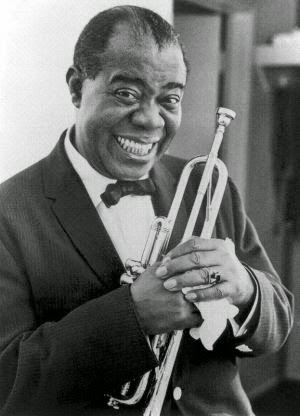 Louis Armstrong is one of my heroes. His autobiography is a joy. The youtube on that link above has Louis Armstrong, my hero, singing about the Mississippi. He really did cross that river in style like he sings he will. Perhaps Julie and I will be boating down that dream weaver, heart-breaker river soon and fending off alligators, snakes and bears? I did read Huckleberry Finn before the last trip, I may this time reread Tom Sawyer. Somehow I need lightenin' up or somethin' apart from these foolishnesses. Then I fly away home again like a bird in a rhyme. Hopefully this return I'll have a plan for something elevated in mind, warming in my heart. If nothing else I'd've seen my extraordinary, kind, astute writer friends once more, and also the place of my dreams in those southern streets of jazz, where possibly some mysterious hoodoo or voodou can evoke pathways for the better, providing well for each of us. That's the plan. I hope you stay with me and read about it. Thanks for your reading this, truly, and feel free to comment, do. FCS - What is that?